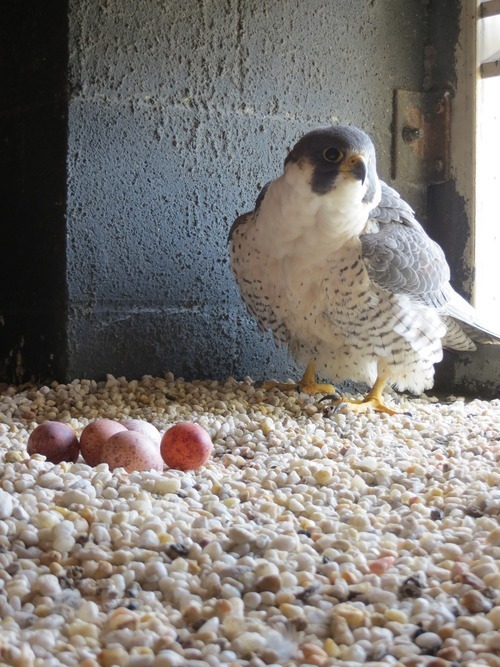 The Richmond peregrine falcons are full of surprises this year, not only did the pair nest in a new location, but a visit by VDGIF biologists on Friday afternoon (March 15th) determined that the pair had ltwo more eggs…for a total of five! This is very unusual for peregrine falcons. Work by CCB from 2002 through 2012 found only 7 five-egg clutches in Virginia during that 10 year period. (source Center for Conservation Biology).